Twitter has become my primary way of getting news these days. News sites require you to go and look for information. With twitter, if the news is important, it will find me. But what makes twitter so powerful is the cottage industry of tools that have popped up using the API to make your Tweeting life easier. There is much debate about the best tools to use, but here’s my 5 tools I can’t live without. 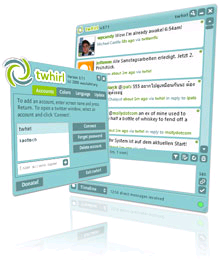 Twhirl is a desktop client built on the Adobe Air platform so that you can tweet and monitor your friends tweets. Some would argue that Tweetdeck is better if you follow alot of people, but Twhirl gets my vote. Viewing and sending tweets on the Blackberry allows you to take Twitter on the road. You could just go to twitter.com in your browser, but loading up Twitterberry makes life so much easier! Iconfactory has released their Mac-based Twitterific for the iPhone, and, of course, it also works on the iPod Touch. Definately the prettiest way to keep up with your tweets. Twitterfeed monitors the RSS feed for your blog (or whatever) and posts to your twitter account every time there is a new post. Cool Twitter toolset which allows you to schedule items to tweet at a scheduled time, as well as other cool tools, like autofollowing, or sending follow thank-you DMs. Hey Joe, Thanks for the follow at @mattmauldin. Digsby looks cool. I’ve moved almost exclusively to Tweetdeck on the Desktop as well as on the iPhone. Great integration between them.